For Many Insurance Companies, Entertainment Coverage is a Sideshow. For Kaliff, it's the Main Event. Learn more about our specialized approach. THE STRENGTH OF LLOYD’S OF LONDON. Learn how this legendary coverage can be a part of your protection portfolio. 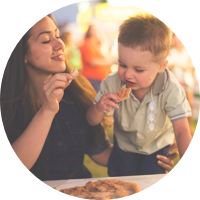 Event and Amusement Coverages are not simply a portion of a myriad of categories in the Kaliff portfolio of lines. It’s our sole business! Our clients have access to our experts 24/7/365 with a century of real world, “Boots on the Ground” industry experience. Every Kaliff client receives unrivaled customer service and response, backed by over 100 years of success. 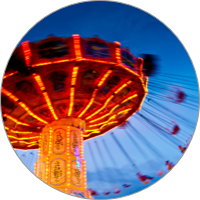 We specialize in the specific risks and needs of each individual category of event and amusement insurance focusing on our client’s unique operations and specialized coverage requirements. We are a Coverholder for Lloyd’s of London, the strongest insurance organization in the world with over three centuries of uninterrupted coverage, and have customized relationships with Domestic Carriers. The “Kaliff Edge” is what differentiates Kaliff from the others in the field and assists your organization and its officers in creating successful events for your patrons and communities. We’re specialists. Every day, our entire staff is immersed in the business of helping protect our clients in the entertainment and amusement business. With a portfolio of some of the most prestigious carnivals, fairs, festivals and events in the country, Kaliff has a background that is unsurpassed in the industry. Knowledge of our clients’ unique needs as well as years of specialty insurance experience, rapid claim handling, quick turn-around time for quotes, nation-wide coverage and superior client support sets us apart from our competitors. A company doesn’t remain robust for 100 years without having a strong operating philosophy. Ours was established in 1917 by our founder, Morris Kaliff. He believed strongly in personal service and building long-term relationships with his clients. His primary goal was to ensure they were well-protected and to stand by them in good times and bad. Three generations later, our industry has experienced quantum leaps in the areas of communication, technology and coverage requirements. But the essence of the way we conduct business at Kaliff hasn’t changed. The customer always comes first. Assessing risk for most companies and businesses is relatively standard and formulaic. But when thousands of people gather together in one space with the primary goal of having a good time, the possibilities for risk becoming real increase exponentially. That’s the reality of the entertainment and amusement industry. At Kaliff, our goal is not only to provide coverage to protect from liability but also to help train and design client training programs to manage and mitigate risk. 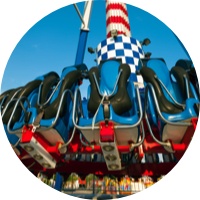 We provide event-specific training and assessment programs based on industry best practices and our own unique experience in the amusement and entertainment industry. Kaliff is also a top provider of specialty entertainment risk insurance, such as: Acts of Violence, an increasing reality at events; Auto, to cover damage to vehicles and trailers; Inland Marine Cargo and Property including buildings and contents that is owned, borrowed or leased; Rain Insurance to protect an event from loss of revenue or unrecoverable expenses and Directors, Officers and Board Member Coverage in case of alleged wrongful acts. Our heritage and experience help us anticipate the needs of our customers and provide them with the safest, most cost-effective policies. Equally important is the ability to expedite approvals so coverage can be put into effect quickly and efficiently. To help enhance those capabilities, Kaliff formed a strategic partnership with Lloyd’s of London, the world’s largest specialist insurance market. Lloyd’s conducts business in over 200 countries and territories worldwide with the unprecedented position of over 300 years of coverage without default. In 2009, Mitchell Kaliff earned the prestigious designation as a Lloyd’s Direct Coverholder, enabling Kaliff to expand direct underwriting authority and have more control in assisting customers. Mitchell is the only such titleholder in the amusement insurance industry and has the authority to underwrite coverage for up to $5 million any one risk through Lloyd’s. We typically choose insurers that have earned an A+ (Superior) or A (Excellent) rating. This ensures our clients are receiving the highest quality coverage. In addition, our insurance carriers are financially sound and able to meet their commitments in the event of an accidental loss.